All rights reserved. No part of this publication may be reproduced, stored in a retrieval system, or transmitted in any form or by any means, electronic, mechanical, photocopying or otherwise, without the prior permission of the copyright owner. Applications for such permission, with a statement of the purpose and extent of the reproduction, should be addressed to the Director, Publications Division, Food and Agriculture Organization of the United Nations, Viale delle Terme di Caracalla, 00100 Rome, Italy. Following recommendations No. 44/225 by the UN General Assembly, FAO decided to investigate the impacts of driftnet fisheries, whether large-scale or coastal, on non-target species. A proposal for a joint undertaking was made at the second meeting of the Planning and Coordinating Committee of the Marine Mammal Action Plan (Geneva, 15–17 January 1990). The PCC recommended the elaboration of such a report jointly by FAO and UNEP and a Memorandum of Agreement was signed on 24 April 1990. 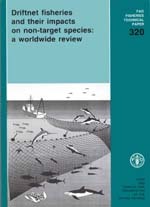 A first draft was submitted for comment at the IWC/UNEP Conference on Mortality in Gillnet and Trap Fisheries, held in La Jolla (California, U.S.A.), 20–25 October 1990. Relevant information contained in the Report of the FAO Expert Consultation on Large-Scale Pelagic Driftnet Fishing, Rome, 2–6 April 1990 (FAO Fish. Rep. 434: 78p., 1990), as well as the Report of the Secretary General on “Large-scale pelagic driftnet fishing and its impact on the living marine resources” has been taken into account. The references are listed as submitted by the author. The Fisheries Agency of Japan kindly permitted the inclusion in this report of unpublished data which were presented to meetings of the International North Pacific Fisheries Commission. Access to published and unpublished documents in the libraries of the United States Marine Mammal Commission, the US National Marine Fisheries Service, Northwest and Alaska Fisheries Center at Seattle, the International North Pacific Fisheries Commission and the Canadian Department of Fisheries and Oceans, Pacific Biological Station, is also gratefully acknowledged. The assistance of Mr D. Nagahata, Dr. R. Hofman, Mr. J. Twiss, Dr. L. Jones, Mr. J. Coe, Dr. B. Skud and Dr. R. Beamish in providing access to such documents is much appreciated. Driftnet fisheries and their impacts on non-target species: a worldwide review. FAO Fisheries Technical Paper, No.320. Rome, FAO. 1991. 115p. Driftnet fisheries throughout the world are discussed and reviewed in relation to current controversies surrounding their usage. In the North Pacific, high seas driftnet fisheries exist for salmon, for squid, and for tunas and billfishes. The Japanese high seas salmon driftnet fishery has declined from a peak of 500 catcher vessels in 1956 to 43 by 1988, each vessel setting around 15 km of netting per night. The 1988 catch was 2550 tonnes of salmon. Non-target species caught have included Dall's porpoises (Phocoenoides dalli) and northern fur seals (Callorhinus ursinus), as well as more than 23 species of seabirds, notably short-tailed shearwaters (Puffinus tenuirostris) and tufted puffins (Lunda cirrhata). High seas drift net fisheries for squid involve over 700 vessels from three nations, taking over 200 000 tonnes of squid annually, using nets typically 40–50 km in length. Non-target catches include northern right whale dolphins (Lissodelphis borealis) and Pacific white-sided dolphins (Lagenorhynchus obliquidens), as well as more than 20 species of bird, including several shearwater species (Puffinus spp. ), numerous fish species, notably blue sharks (Prionace glauca), and also leatherback turtles (Dermochelys coriacea). The tuna and billfish high seas driftnet fishery involves more than 500 vessels from Japan and Taiwan (Province of China), catching some tens of thousands of tonnes of albacore, skipjack and other tuna species. Non-target catches are as yet poorly known. Coastal driftnet fisheries in the North Pacific are also briefly addressed, and the limited information on non-target catches is reviewed. High seas driftnetting is due to be phased out of the South Pacific, but in the 1988/89 fishing season up to 194 vessels may have participated, targeting albacore, with estimated catches of up to 52000 tonnes. Non-target catches are known to have included common dolphins (Delphinus delphis) among other cetacean species, leatherback turtles, several bird species and numerous species of pelagic fish. Coastal driftnetting is important in South America, where a variety of larger pelagic fish, including swordfish, are targeted. Large catches of several cetacean species are also recorded, some of them being taken deliberately. High seas driftnetting in the Indian Ocean includes a fleet of some 130 vessels from Taiwan (Province of China), catching up to 20 000 tonnes of albacore and other tunas. Non-target catches are not known. Very large numbers of vessels use driftnets throughout the northern Indian Ocean and Indo-Pacific region in waters under national jurisdiction. In many cases non-target catches are not known, or else most of the catch is utilized. Relatively large catches of cetaceans have been recorded in Sri Lankan driftnet fisheries. A Taiwanese driftnet fishery also operates in the Arafura Sea, and is reported to have taken 20 000 tonnes of tunas, Sharks and spanish mackerel in 1987. In the Atlantic there is good evidence that Taiw23anese vessels are also operating driftnets for tuna species on the high seas, but detailed information is lacking. Some 40 driftnet vessels, mainly from France, operate on the high seas of the Northeast Atlantic, and these took 750 tonnes of tuna in 1988. Non-target catches include common dolphins and blue sharks. Some 700 Italian swordfish in 1988. Non-target catches include striped dolphins (Stenella coeruleoalba) and sperm whales (Physeter macrocephalus). There are numerous other small scale driftnet fisheries in the North Atlantic, where harbour porpoises (Phocoena) and several alcid bird species are frequently reported among non-target catches. Criticism of driftnet fisheries are reviewed. Competition with other fisheries is an important consideration, and several factor are considered. Environmental damage is perhaps a more important criticism. Impacts on individual species are considered. In almost all cases there is insufficient information to assess the impacts of driftnet fishing on populations of non-target species. Generally this is because little is known of the population size or dynamics of the species involved. Possible management measures are discussed in relation to limiting environmental damage.